In this installment of From Storage to Stovetop we are featuring Freeze-Dried Spinach and Freeze-Dried Kale and showing you exactly how WE use them in our kitchens. We especially love them for green smoothies, but there are a ton of other ways you can get your greens on using these two products. Since the leafy products condense down so small when they are freeze-dried you can pack a lot of nutritional punch into a small serving. So healthy and they taste great too! In the video below Jodi shares some of her favorite tips for using these two “green” products to add a little extra nutrition to whatever she is making. 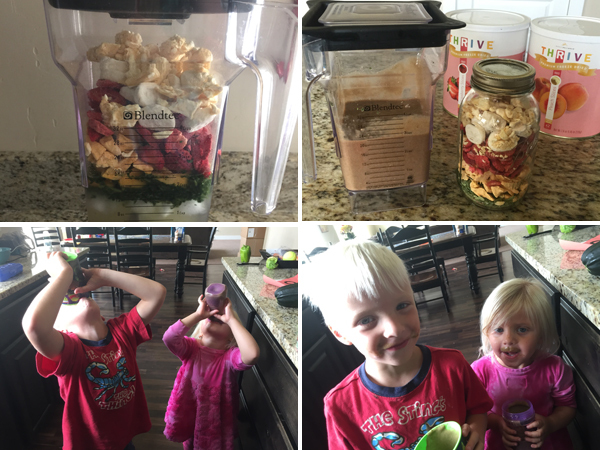 While throwing them in smoothies is the easiest thing to do, they are delicious in many other recipes as well. 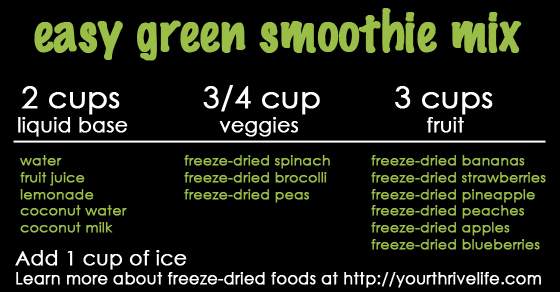 As mentioned in the video, both the spinach and kale are fabulous to use for green smoothies. I like to make mixes ahead and put them in quart jars so when it’s time to make my daily smoothie I don’t have to pull out 5-6 cans. Just dump the jar in and go. Here is a basic formula you can use to make any smoothie turn out great. As you can see, these are even VERY kid-friendly!